Latest News: The Application for Darmasiswa RI Scholarship Programme for year 2018/2019 is now OPEN. 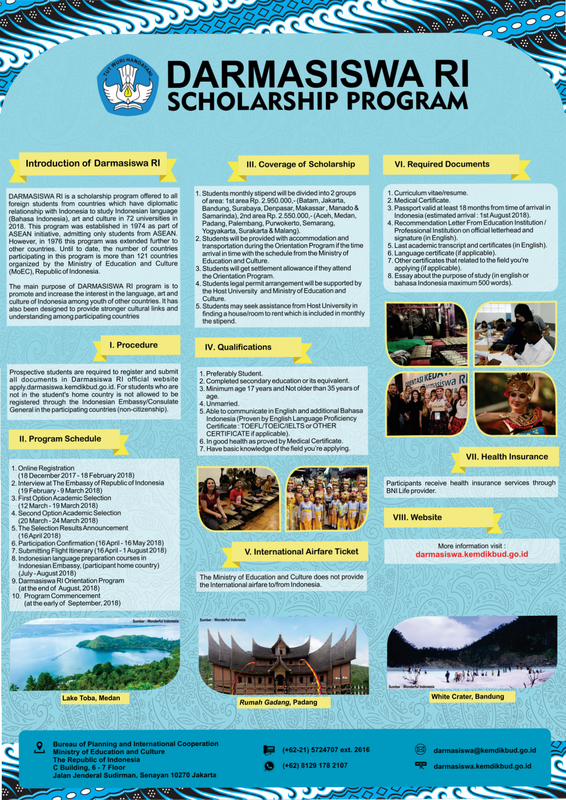 DARMASISWA RI SCHOLARSHIP is a scholarship programme offered to all foreign students from countries which have diplomatic relationship with Indonesia to study Bahasa Indonesia (Indonesian Language), traditional music, traditional dance and Indonesian crafts. Candidates can choose 1 out of 46 universities in which the programme is carried out (see here). These universities are located in different cities in Indonesia. The programme is organized by the Ministry of Education and Culture (MoEC) in cooperation with the Ministry of Foreign Affairs (MoFA). The programme was started in 1974 as part of ASEAN (Association of South East Asian Nations) initiative, initially admitting only students from ASEAN. However, in 1976 the program was extended to include students from other countries such as Australia, Canada, France, Germany, Hungary, Japan, Mexico, the Netherlands, Norway, Poland, Sweden and USA. In the early 90’s, the programme was further more extended to include all countries which have diplomatic relationship with Indonesia. To date, the number of countries participating in the program is more than 75 countries. Prospective students are required to register and submit all documents in Darmasiswa RI official website apply.darmasiswa.kemdikbud.go.id. For students who are not in the student’s home country is not allowed to be registered through the Indonesian Embassy/Consulate General in the participating countries (non-citizenship). Please click here to read about the programme regulations.